We are planning an interim conference in Pavia Italy on the days of May 30,31 2017. 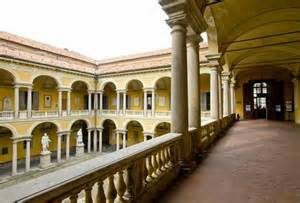 Pamela Pansardi has generously offered to host the conference at the University of Pavia. We already have some proposals, and are looking forward to many more. Here is the theme below. THE DEADLINE for proposals is NOVEMBER 15, 2016. As usual, a title and short abstract will be sufficient. The study of power has traditionally been grounded in action and capabilities. However, power also inheres in modes of human endeavor that are not actions and material capabilities, but expression. The impact of language, for example, in some contexts has achieved a level of influence that often approaches that of action. Terms such as “trigger warnings” and “micro aggressions” are manifestations of growing narrative about the power of language (i.e., the power to provoke action or emotion). The old cliche of “sticks and stones….” is far less relevant in a world in which language possesses heightened influence. But language is only a subset of a greater process of human expression which is here defined as narrative. Narrative is conceptualized in the broadest possible manner. It includes all forms of expression that create a story: speech, the written word, symbols, artistic expression, performance, etc. Narrative in this analysis is contemplated in contradistinction to action. Hence, what is demonstrated is more important for our scholarly purposes than what is actually done. (Of course, demonstrative actions could also be considered a form of narrative. And hence action and narrative can be intertwined.) In a world were narrative has achieved a pronounced power status, it is useful for students of power to engage in a scholarly analysis of this phenomenon in its various manifestations. All subfields of political science have concerned themselves with the power of narrative. Comparatives have evaluated the creation of narratives through the use of national symbols and rhetoric. International relations scholars have been interested in how nations use narrative in both war (swaggering, threats, propaganda) and peace building (truth and reconciliation initiatives). Political theory has a long and rich tradition of studying the power of ideational processes that create a narrative. Hence, the scholarly net cast for this conference is intended to range far and wide in terms of field and philosophical tradition. The conference will be guided by the question: In what ways do people create narratives and what sorts of power inhere in these forms of expression? The conference has been funded through the generosity of the Department of Government and the College of Social Studies at Wesleyan University. Recognized as a study group since 1983.